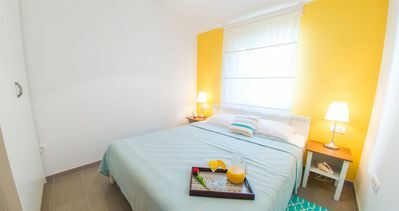 This studio apartment is equipped to accommodate 3 persons, with a double bed and a convertible sofa for another person.The unit is equipped with a kitchenette, sink and refrigerator, table and two chairs, satellite TV, wi-fi. The bathroom has a tub and toilet. The unit shares a terrace with a number of other units. 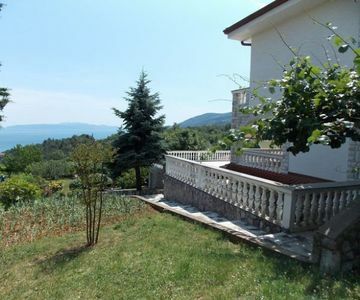 Villa Edina is located in a small place called Icici, about 1.5 km by road from the center of Icici and the beach and about 5 minutes on foot by stairs from the apartment. The nearest beach is located in the center of Icici and can be accessed by road (approximately 1,5 kilometers) or on foot down the stairs in 5 minutes. Each apartment has a reserved parking space. In the yard is a grill and a playground for children. For stays shorter than 3 nights a supplement of 30% are charged.Tourist tax is not included in the price and it is charged 1€ per person per night.